If it's currently fig season where you are, then you know just how lucky you are. Although figs are native to the Middle East, where they are hugely popular, they now grow in many parts of the globe. In the United States, the figs you find in the market are likely from crops in California and harvested during the late summer and early fall. They're eaten raw, in salads, baked, in cakes and other pastries, dried or lightly roasted. They're as beautiful as they are delicious and are amazing on any appetizer platter. They're also super easy to stuff with cream cheese, goat cheese or labneh. A quintessential Middle Eastern favorite, labneh is a soft cheese made from strained yogurt. You can buy it readymade but it's easy to make at home with just yogurt, salt and cheesecloth. The longer you strain the yogurt, the thicker the labneh will be so, by making it yourself, you can control the firmness. Leave it on the softer side for stuffing into the figs. Then drizzle on your favorite variety of honey and top with chopped pistachios or walnuts for a bit of added crunch. To make the labneh, stir together the Greek style yogurt and salt until thoroughly combined. Place the mixture in a fine mesh strainer that you've lined with cheesecloth. Tie the ends of the cheesecloth together to gently squeeze the mixture. Place over a bowl, making sure the bottom of the strainer does not touch the bottom of the bowl. Leave on the counter for one hour, draining off the liquid 2 or 3 times. You can also do this in the refrigerator if your house is too warm but it will take longer. At the end of the hour, you will have a soft labneh. Score each fig with an X about a third of the way through. Place them on a baking sheet lined with parchment paper and roast in the oven for about 10 minutes. The figs will be a little softened and slightly beginning to brown. Remove from the oven and allow them to cool for a few minutes. Place about a tablespoon of the labneh mixture (or however much will fit) into each fig. You can do this with a spoon or a piping bag if you want it to look neater. 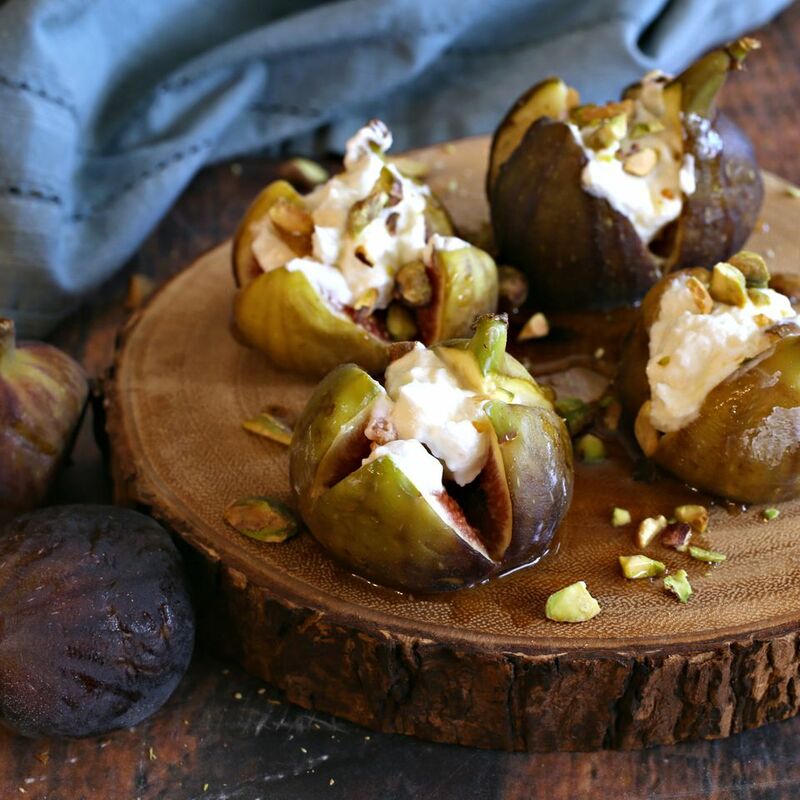 Place all the stuffed figs on a serving platter and drizzle with the honey. Then top with the chopped pistachios. Serve with wine and cheese, if desired.